I now use the familiar iOS style button to turn AirPrint Hack ON or OFF. There is also a status light and text indicator about what the current state of AirPrint is on the system. Same 3 files copy under the hood. I must say I have a blast learning AppleScriptObjC at the same time. It’s a pretty powerful language that is easy to learn. Grab the updated version right here. iPad, iOS 4.2.1, can’t find the printer. One of the paid apps was able to find the printer. Would like to not have to have an app running on the Mac in order to print. Have you removed the printer in the System Preference Pane, added it back and then shared it? You have to do those steps for the printer to show up. How about a version to work on 10.5.8 on PowerPC?! Sorry, only work with 10.6.5. Absolutely wonderful, thanks! Using Brother HL-2030; installed airprint-hacktivator; deleted printer and re-installed it. Went to iPad, selected the printer and printed a Safari page. Just like that. Perfect, Why didn’t Apple leave this in, even with the ability to work on some printers. Once I delete the printer in order to add it back it doesn’t show the printer anymore…deactivate the Hacktivator, reboot the computer still nothing wireless HP Photosmart C7280, Mac Os 10.6.5 iphone iOS 4.2.1 iPad iOS 4.2.1. Hum, not sure how you add a network printer. Should be the same way you added it originally. 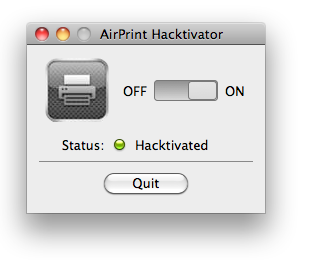 AirPrint Hacktivator only add udftopdf filter to the system. Awesome hack, downloaded the v1.5 and rebooted, works like a charm! You must remove the target printer ( the printer must have Bonjour enabled ) from Print & Fax in system preferences. Add it back and tick “Share this printer on the Network”. A marvellous piece of Software. Thank you Troughton Smith and the people who packaged it. Hey, small quibble with the hack: the apple system firewall interferes with it and I can’t figure out how to set the advanced settings to allow the incoming connections. Thoughts? Thank you soooo much!, it works direct connection from my Laptop, and it also works from Airport Extreme USB connect as well. you are the best! I removed all printers and re add all, checked (share this printer on the network).